On March 17, 1969, Bing Devine made a deal that sent first baseman Orlando Cepeda to the Atlanta Braves in exchange for catcher/third baseman Joe Torre. The trade was not well received in St. Louis. Cepeda took home the league’s MVP award in ’67. That same year he helped bring another World Series title to the organization, and the next year he would help them win another pennant. 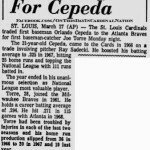 While the Cardinals did win the National League pennant in ’68, Cepeda’s batting average sank to .248, at 31 years of age he was reaching a turning point in his career which had a downhill slope on the other side. On the other hand, Torre was 28-years-old at the time and was just beginning to peak. The trade turned out to be a great deal for the Birds as Torre spent the next six seasons in St. Louis, batting .308 with 96 homers. Torre’s greatest achievement while wearing the birds on the bat came in 1971, when he took home the league’s MVP award.